In addition to being the body’s main detoxifying organ, the liver is also the body’s main fat-bruning organ. When the liver becomes sluggish from accumulation of toxins from foods, beverages, medications, skin care products, hair products, and environmental pollution, it becomes less efficient in its fat burning role and begins to store fat instead. Milk Thistle is an herb that can help cleanse and support the liver to restore its ability to burn fat efficiently. Milk thistle is native to regions of the Mediterranean and has been used for over 2,000 years for its liver healing properties. More than 300 studies have now shown that its active ingredient, silymarin, can protect liver cells from the poisonous effects of alcohol and other toxic chemicals. It inhibits free radical formation and boosts glutathione levels in the liver by over 33 percent. The active ingredient in milk thistle is an antioxidant flavonoid compound called Silymarin, which has three components: silybin, silychristin and silydianin. Several studies have proven that milk thistle can actually regenerate liver cells that have been damaged by cirrhosis and infectious hepatitis. It is incredibly antifungal and has been used as an antidote to poisoning by the deathcap mushroom. It is even being studied as a way to slow the growth of prostate cancer. Silymarin has antioxidant properties. Antioxidants are thought to protect body cells from damage caused by a chemical process called oxidation. Silymarin has anti-inflammatory effects, which keeps liver cells from swelling in response to injury. Silymarin seems to encourage liver cell growth. By changing the outside layer of liver cells, it prevents certain toxins from getting into liver cells. 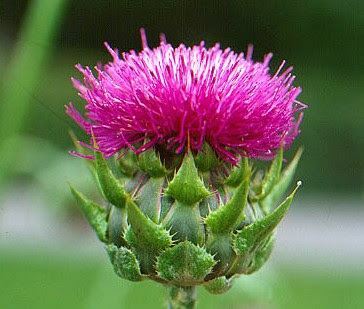 Other purported uses for milk thistle include the treatment of heartburn, loss of appetite, symptoms of gallbladder disorders, diabetes, increasing breast milk flow, inducing menstrual flow and even hangovers. Researchers have found that Milk thistle is not well absorbed into the body as a brewed tea because the silymarin is not water soluble. It must be extracted using alcohol, therefore it is best consumed in extract form, either as a dried powder in capsules or in tincture form. Adding the tincture to a cup of warm water makes a more effective tea. The suggested dose of milk thistle from the Physicians Desk Reference is generally 200 to 400 mg of silymarin per day. Very few side effects if any have been associated with milk thistle. Milk thistle is considered safe when you follow the recommended dosage. If you are pregnant, consult with your doctor before taking milk thistle. What Exactly IS Kosher Salt?